Warning : This will require appropriate technical resources on the clients side to be able to implement. We recommend making sure you have someone from your organization with experience available to streamline the process. Our support team is available to help, but may not be not be able to answer questions or solve problems that are unique to your company. Active Directory (AD) systems can be synchronized with this system to automatically create local accounts through scheduled sync jobs. NOTE: A prerequisite to creating an AD sync job is that AD server authentication must have already been configured in the portal. See Setting up Active Directory (AD) Server Authentication . 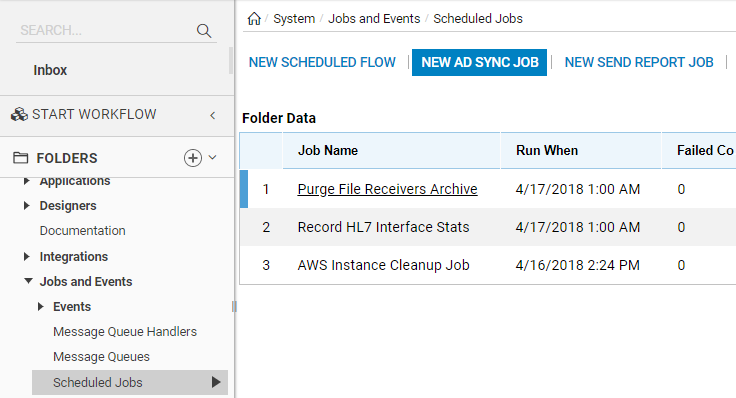 To create a sync job for AD accounts, navigate to System > Jobs and Events > Scheduled Jobs	and click the Add Schedule Job	button. 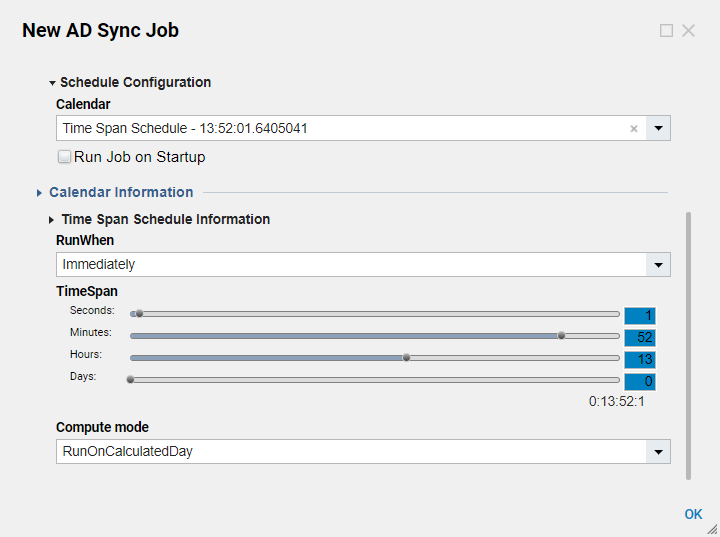 In the resulting Schedule Job	dialog, select Active Directory Sync Job	and click Next	to define which AD server to synchronize and on what schedule. We will begin by navigating to System > Jobs and Events > Scheduled Jobs	and clicking the New AD Sync Job	button. In the New AD Sync Job	dialog, we will select the Sync All Domains	. To ensure that this sync job is re-queued in the event of a failure, we will select the Requeue if Job Fails	checkbox. Under Schedule Configuration	, in the Calendar	drop-down select Time Span Schedule. we will select Immediately	in the RunWhen	drop-down list, and then we will use the TimeSpan	controls to define an interval of 18 hours, 35 minutes and 1 second. This means that every 14 hours, 1 minute and 46 seconds, our system will immediately try to synchronize with our AD server. This completes our configuration, so we will click the OK	button. 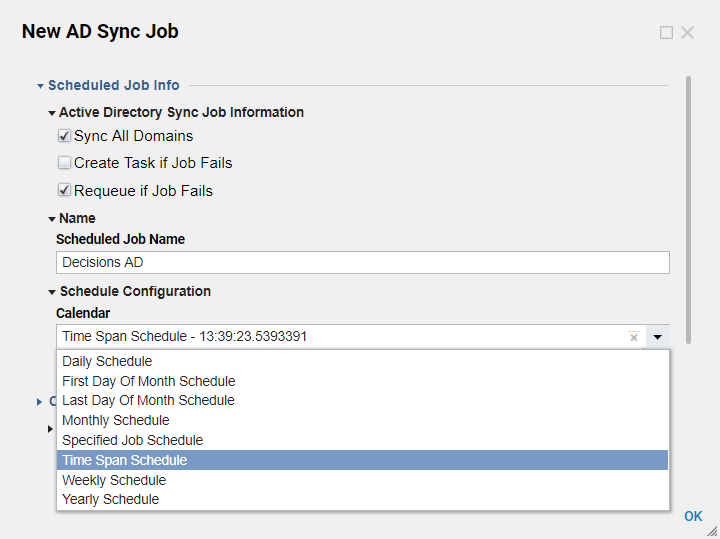 Our new sync job will appear in the Scheduled Jobs	folder, where we can run it manually or manage it.